Synthetic peptide conjugated to KLH derived from within residues 1 - 100 of Human GW182. This antibody gave a positive signal in MCF7 cell line within ICC/IF as well as in NIH3T3 within WB. Our Abpromise guarantee covers the use of ab156173 in the following tested applications. WB Use a concentration of 1 µg/ml. Detects a band of approximately 270 kDa (predicted molecular weight: 210 kDa). Plays a role in RNA-mediated gene silencing by both micro-RNAs (miRNAs) and short interfering RNAs (siRNAs). Required for miRNA-dependent repression of translation and for siRNA-dependent endonucleolytic cleavage of complementary mRNAs by argonaute family proteins. Belongs to the GW182 family. Cytoplasm > P-body. Mammalian P-bodies are also known as GW bodies. ICC/IF image of ab156173 stained MCF7 cells. The cells were 100% methanol fixed (10 min) and then incubated in 1%BSA / 10% normal goat serum / 0.3M glycine in 0.1% PBS-Tween for 1h to permeabilise the cells and block non-specific protein-protein interactions. The cells were then incubated with the antibody (ab156173, 5µg/ml) overnight at +4°C. 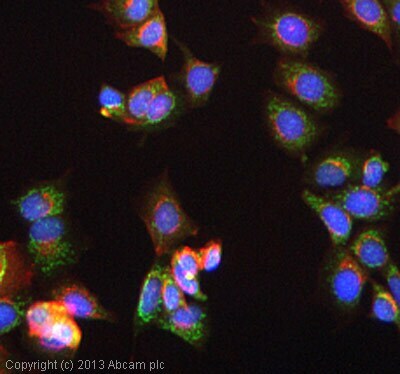 The secondary antibody (green) was ab96899, DyLight® 488 goat anti-rabbit IgG (H+L) used at a 1/250 dilution for 1h. Alexa Fluor® 594 WGA was used to label plasma membranes (red) at a 1/200 dilution for 1h. DAPI was used to stain the cell nuclei (blue) at a concentration of 1.43µM. This antibody also gave a positive result in 100% methanol fixed (5 min) HeLa and HepG2 cells at 5µg/ml. Additional bands at: 31 kDa, 50 kDa, 60 kDa, 75 kDa, 98 kDa. We are unsure as to the identity of these extra bands. This blot was produced using a 3-8% Tris Acetate gel under the TA buffer system. The gel was run at 150V for 60 minutes before being transferred onto a Nitrocellulose membrane at 30V for 70 minutes. The membrane was then blocked for an hour using 5% Bovine Serum Albumin before being incubated with ab156173 overnight at 4°C. Antibody binding was detected using an anti-rabbit antibody conjugated to HRP, and visualised using ECL development solution. ab156173 has not yet been referenced specifically in any publications. Publishing research using ab156173? Please let us know so that we can cite the reference in this datasheet. There are currently no Customer reviews or Questions for ab156173.